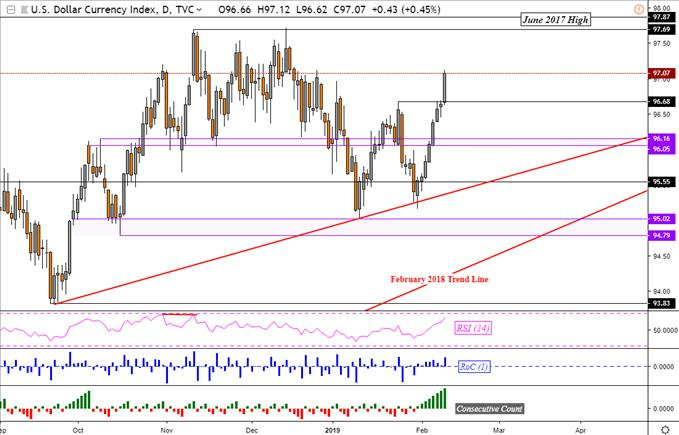 (MENAFN - DailyFX) Asia Pacific Market Open Talking Points Sentiment unexpectedly improved before Europe trade commenced, a clear catalyst seemed absent British Pound weakness accelerated on soft UK GDP data, Asia Pacific stocks may see mixed day US Dollar has best winning streak since 2016 as key resistance cleared, eyeing late 2018 highs Trade all the major global economic data live and interactive at the DailyFX Webinars . We'd love to have you along. After a rather mixed Asia trading session on Monday, market mood considerably improved heading into the European trading session. Several newswires attributed this to bets on a trade agreement between the US and China as Treasury Secretary Steven Mnuchin and Vice Premier Liu He head for talks later this week. That seemed doubtful. Around 7:21 GMT (9 minutes before S & P 500 futures took off) China said that there is no information available on a meeting plan between presidents Donald Trump and Xi Jinping. What did cross the wires shortly before sentiment surged was a report from the Bank of France that its home economy is expected to grow 0.4% in the first quarter of 2019. Since this would be a step towards avoiding a technical recession (after Italy went into one), it is not too surprising to see the DAX and Euro Stoxx 50 find gains of almost one percent each. What is more interesting is that the Euro and British Pound generally weakened as the US Dollar gained. Meanwhile, government bond prices from the world's largest economy fell as stocks rose. This perhaps supports the argument that as external risks for the Fed abate (in this case the reduction in bets on weakening growth from abroad), the US Dollar stands to gain the most . A considerably more dovish central bank leaves the greenback at a discount if rate hike bets get revived. This could leave equities more vulnerable down the road. After equities rallied and the British Pound headed lower, weakness in Sterling was amplified on softer-than-expected domestic economic growth data. The first estimate of Q4 GDP clocked in at 1.3% y/y versus 1.4% expected. By the end of the day, GBP/USD closed at its lowest since January 16 while the US Dollar took advantage of its weakness. By Monday close, Wall Street showed a mixed trading session (similar to Friday's). The S & P 500 was up +0.07% while the Dow Jones Industrial Average fell 0.21%. S & P 500 futures are little changed, suggesting another mixed day to come. The Australian Dollar may see some slight volatility if business confidence sours. DXY TECHNICAL ANALYSISThe DXY rallied 0.44%, extending its winning streak to 8 consecutive days (best since 2016) as prices closed at their highest this year thus far. Resistance was cleared at 96.68, exposing the November/December 2018 highs around 97.69. For more timely updates, you may follow me on twitter @ddubrovskyFX for the latest market moves.